Calculate and purchase custom mounting for your own print, and ship your print to us. 2. Purchase at a local Authorized ARTiPLAQ™ Dealer store. Save shipping costs. Custom Mounting Dealers- You bring your artwork to them. We pick it up (weekly), mount it in our workshop and return the to the store for you to pickup. Nautical Chart Dealers- You can view and purchase local nautical charts already mounted and can make special orders. 3. Mail us your art work with a work order form. If you prefer not to process your order on this website, you can ship your prints directly to us with a completed work order. We charge our retail price, plus shipping. If you need it sooner than our standard two week turn around (that includes shipping) call us at (207)772-2025 or email us to see if we can accomodate your rush. If we can fit it in to our production schedule, you'll complete a work order form and ship with your job. (We post the cut-off date for Christmas rush orders, on our Facebook page.) We'll charge your credit card when the job is ready to ship. The rush fee is 15% of your order, plus $5, plus optional expedited shipping. We accept Mastercard and Visa. If mailing art to us, please be sure to track your package so you know it arrived. If you have a job too complicated to process on this website such as a multiple mount (which is more than one print on the same board), you can fill out a work order form and mail it to us with your print. You can send a check or If you include your credit card info, we'll charge your card prior to shipping. (We accept Mastercard and Visa.) If you have questions, you can email us at info@artiplaq.com. We'll calculate your price and email you an invoice. 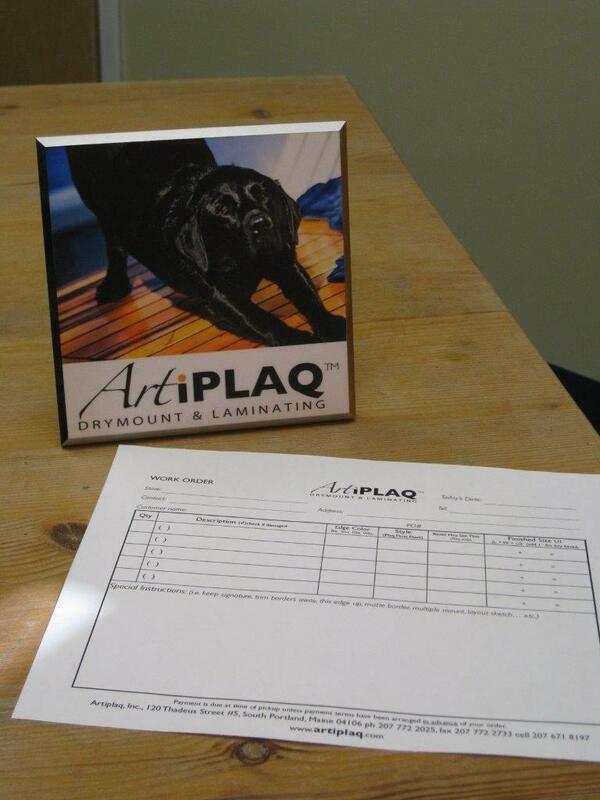 We are unable to ARTiPLAQ™ anything that is already laminated and will return ship to you at your cost. Wondering how we price our product? We ADD the width PLUS the height to get the “UNITED INCH," then refer to our retail price sheet. (We round up each dimension fraction to the next whole size.) We can do any dimension from 4 x 6 inches to 48 x 96 inches! Our prices are based on the finished plaque size. Printing photos and charts is an additional cost. We no longer do dimensions less than 4 x 6 inches.